I read this in two days- it is so good! There is a profusion of interesting and lovable characters, and I found it fascinating to hear the story only through letters and telegrams. My only complaint was that the author waited until the absolute end to resolve the building conflict. It made the conclusion seem too quick; I wanted to relish in it longer and to see how it played itself out. This is how one usually feels when a book ends that was a pure joy to read. C.S. Lewis says, “You can never get a cup of tea large enough or a book long enough to suit me.” I would have been happy for this book to go on forever. I love the WWII era- they were such a chivalrous and scrappy people. To think of so many nations fighting the same fight. Yes, they all had their own reasons. Some entered the fray before others. Some did so reluctantly. But they sacrificed. They lived in wartime and felt the effects of it. Unlike now, when I had to explain to my little girl that actually our country is at war and has been for many years. No, we don’t see the fighting. No, we don’t feel the danger. No, we don’t have to give up anything for it. It felt absurd to say. It feels a bit absurd to live. Hear me, I love that my children don’t live in a war zone, but there is something beautiful and strong that emerges within a people who have suffered. Those who have been brought low have a greater capacity for seeing every little thing as a gift. And those who have been brought low together experience a deep connection with one another. Then think of the scale of the connectedness! These were the thoughts traveling through my mind as I read this book, where destruction from the war was everywhere. It was on the front porch, in the empty seat at the table, piled up against ruins of buildings, and in bones showing through the skin of meager bodies. But what beauty and valor came of it! So that’s one love this book hit on for me. The other was letter writing. The book is told entirely from letters, with an occasional telegram thrown in. It occurred to me how much fluff was removed from the book because of this. Imagine if your only way to communicate was through writing! That back and forth conversation with your best friend written in the form of letters. That is the way to cut the fat of what we say! You don’t go to the trouble to beat around the bush. It’s trickier to hide behind small talk. Letter writing is intentional; nothing slips out. You speak as much by what you don’t say as by what you do. It revolutionized the conversation! 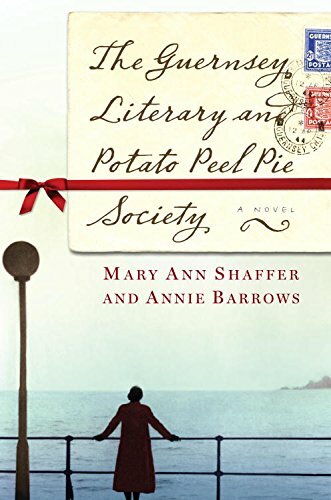 I found myself laughing out loud until my sides ached, holding back tears with a quivering lip and tight throat, and thinking upon the connections these characters made with the authors and books they read long, long after setting the book down. The poetry and stories lived on inside of them as this story will live on inside of me.